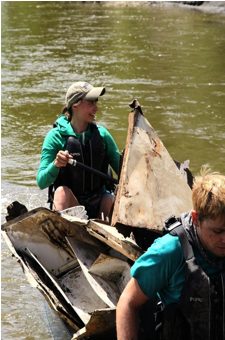 On July 12th 2014, AmeriCorps members and student volunteers from the University of Northern Iowa began their journey on Iowa Project AWARE (A Watershed Awareness River Expedition), an annual river cleanup program coordinated by the Iowa Department of Natural Resources. Located in Northwest Iowa and Southeast South Dakota, the Big Sioux River was the chosen watershed to paddle and clean for 2014. Through a first-time partnership between UNI’s Office of Sustainability and Outdoor Recreation Program, UNI participants were able to experience an adventure they will never forget. DNR Staff spent arduous hours transferring the waste from canoes to recycling stations along the Big Sioux. “[This was] the most organized clean up I’ve ever been a part of,” said freshman Evan Marsh, “it’s truly amazing to see what you pull out of the river.” More than 540 tires were gathered by AWARE volunteers, along with 39,840 pounds of scrap metal, 4,736 pounds of recyclables, and 560 pounds of household hazardous material. The UNI Office of Sustainability and Outdoor Recreation Program are looking forward to continuing to participate in Project AWARE. “There is such a need for young people to be involved in this initiative. Our goal at UNI is to continue supporting AWARE. by sending student volunteers and encouraging other universities to do the same,” said Jamieson.